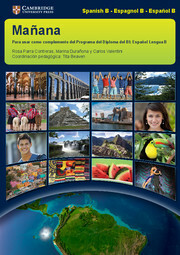 This coursebook prepares students for the 2013 Spanish Language B syllabus (first examination 2015), at both Standard and Higher Level. It is totally international, offering authentic materials from a variety of Spanish-speaking countries. The texts and topics have been chosen because of their intrinsic interest to young people, and to enable students to develop a genuine intercultural understanding. The exercises are carefully designed to develop students' linguistic abilities, while encouraging them to develop critical thinking skills and allowing them the opportunity to interact personally with the material. Offers a lively and stimulating choice of authentic texts and engaging activities, with an attractive, student-friendly presentation. Culturally relevant visual prompts facilitate oral discussion in the classroom and help prepare for the Individual and Interactive Oral tasks of the examination. Text types are explored in depth in specific chapters: model texts, detailed analysis and practical checklists are provided for different text types and registers. Suitable for both Higher and Standard Level, with links to ToK throughout the book and literature fully integrated into every chapter. All Core and Optional themes are fully covered. The coursebook offers guidance and ample practice for the writing and speaking tasks of the examination, with a full chapter dedicated to the Written Assignment, now updated to match the 2013 syllabus requirements (first examination 2015).